If you are still hiding the kid’s leftover Halloween candy, there are other ways to celebrate Valentine’s Day without overdosing on chocolate. How about an activity that actually helps them burn off a little of that sugar rush? I like to turn to Alice in Wonderland’s Queen of Hearts for inspiration. 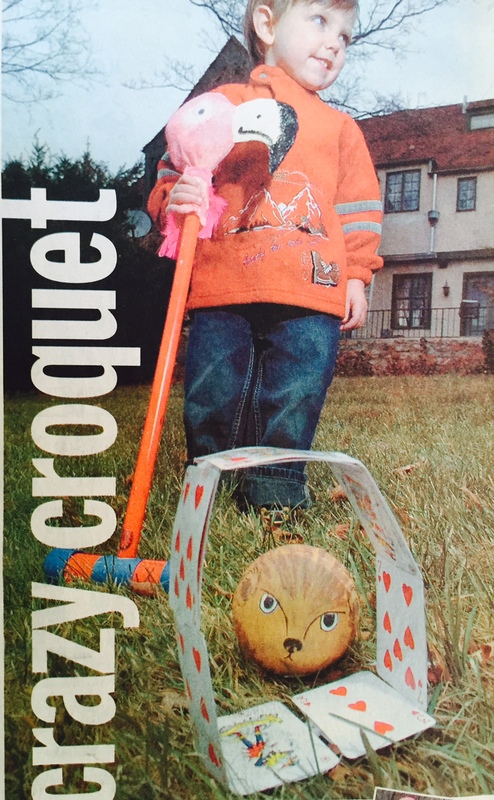 When she played croquet, it was no ordinary match. 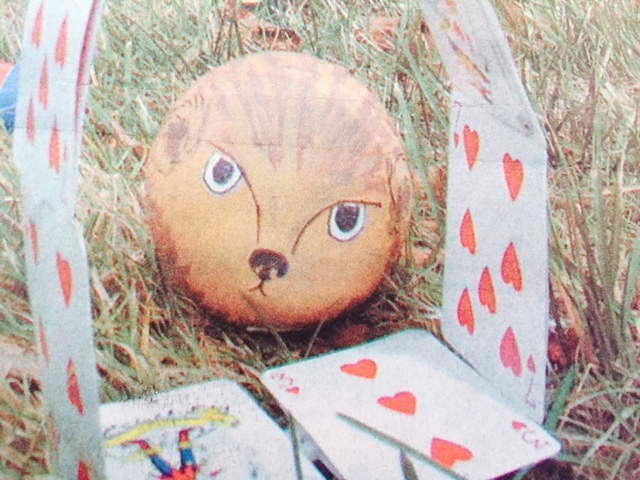 The court would swing pink flamingos at roly-poly hedgehogs. This is a great game indoors as well as outdoors. Think rainy day miniature golf and dream up your own obstacle course using stuffed animals, sofa cushions for tunnels and books for ramps. 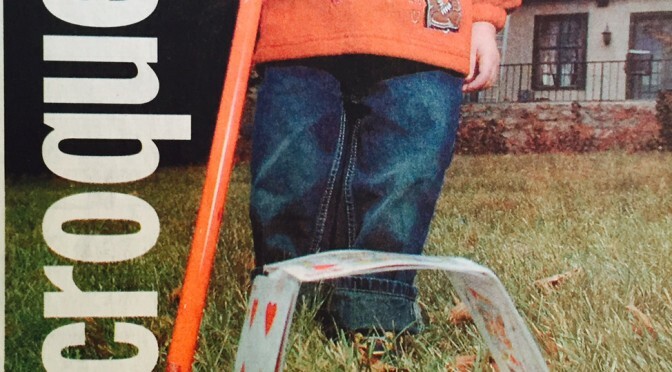 I even like to make big, bend able wickets out of playing cards and pipe cleaners. 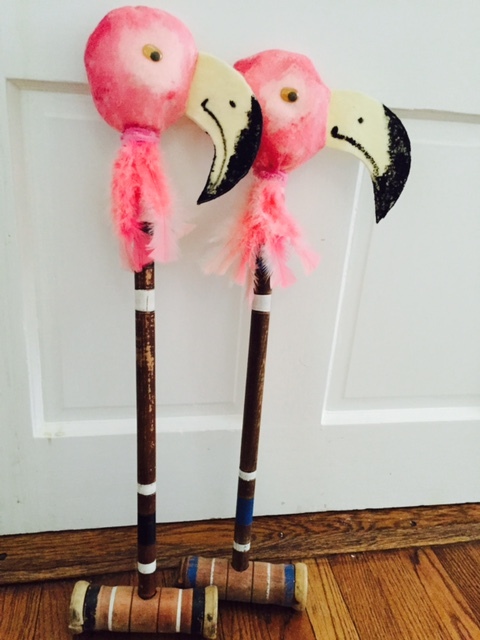 An ordinary croquet set can be transformed into a flock of flamingo mallets with some easy-to-sew felts heads. Rules…What rules? Unlike traditional croquet this is an improvisational sport. However– should anyone get too unruly shout “Off with her head”! (and take a time-out.). Fold a piece of pink felt in half (6” x 9”) and cut through both layers into sort of a light bulb shape. Cut remaining pink felt the same way. Fold yellow felt in half (6” x 9”) and cut through both layers to make crescent shaped beaks. You should be able to get 3 double sided beaks out of one square. Glue two sides of each beak together and allow to dry. Pin beaks to one side of felt heads, facing inward. Pin remaining felt head piece on top and sew around edges, leaving bottom open. Turn inside out. Stuff heads with cotton and place over ends of mallets. Secure around stick with a pink pipe cleaner. Secure feathers around neck by wrapping with pipe cleaner. Paint end of beaks, mouth and nostril with black paint. Accent head of flamingo with darker pink paint. Glue on hobby eyes. Paint styrofoam balls to look like furry brown hedgehogs. Twist ends of white pipe cleaners together to add length. Tape cards along two parallel cleaners and bend into a D- shaped wickets. When I look out the window this winter, it’s hard to believe there was actually a February when we kid-tested this game for my column in The Connecticut Post on my neighbor’s lawn! However, you can just as easily set up Crazy Croquet in your living room as we are about to do! What a way to enjoy yet another snow day. Previous PostSnow Day Snow MenNext PostFrom Cherry Trees to Wooden Teeth– Happy Birthday Mr President!